With the recent Facebook privacy scandal, which in fact has always been a problem not only with Facebook, but with almost all cloud services, people are becoming more aware of the issue, and taking some measures to protect their privacy. Besides avoiding suspicious Facebook apps and unknown "friends", which is the root of the recent scandal, our privacy can be, and in fact is, breached without our consent on a daily basis, by ads and tracking code on websites, spywares that invaded our devices, or even legitimate apps bundled with not-so-legitimate tracking code. A good way to vastly decrease this privacy breach (but not totally avoid, as it would take additional measures), is to use a good ad-blocker. 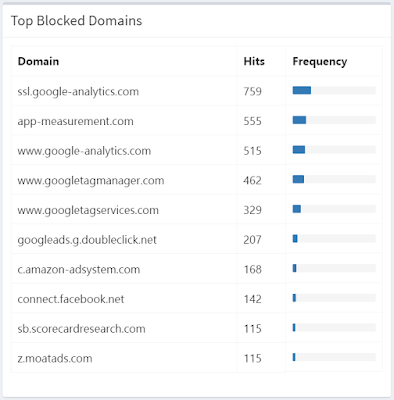 Despite the name, they not only block ads, but also some spywares or even other malwares, as long as you use a good blocking list (I'll explore it later on this article). They can be installed as a browser extension, working only for the websites you visit; as a system app, working for all apps on your device; or as a network service, working for all devices on that network. 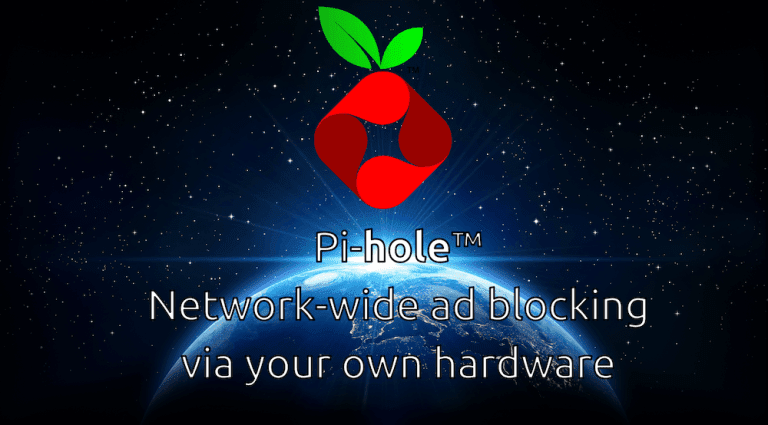 In this article, I will show you how to protect your entire local network with an open-source, simple to install, lightweight and fully functional network ad-blocker: Pi-hole. DNSmasq: a lightweight DNS and DHCP server, widely used on Linux servers. 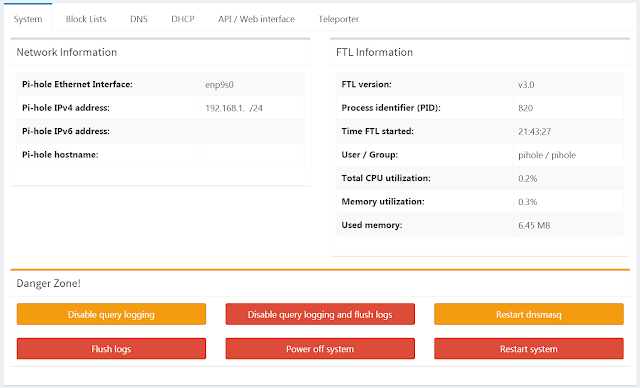 Lighttpd: a simple, fast and light HTTP server, used for the Pi-hole web interface. 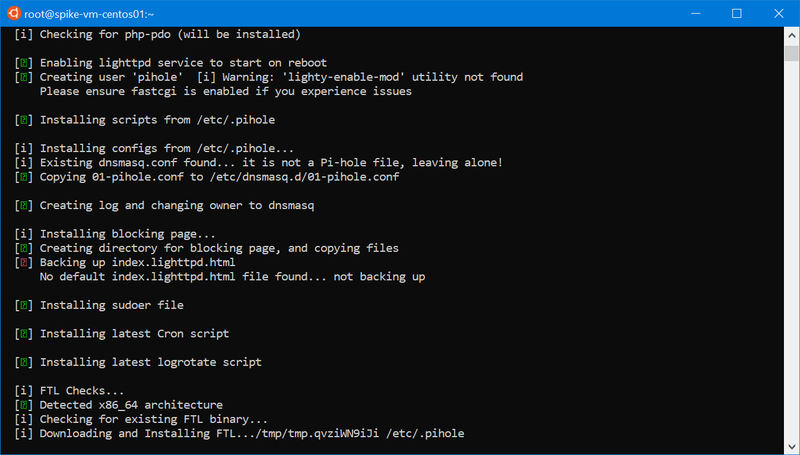 PHP: the popular web development language, used for the Pi-hole web interface. FTL engine: the Faster-Than-Light engine, developed by the Pi-hole team, used to provide statistics for the web interface and an API. AdminLTE Dashboard: Pi-hole's web interface, featuring a control panel for full systems management and statistics visualization. 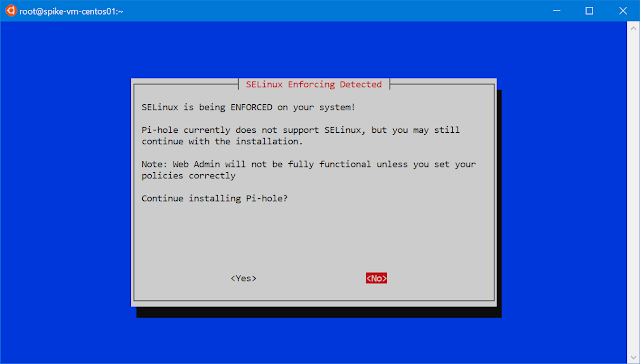 The Pi-hole installation is very simple, prepared to be straightforward on most major Linux distributions. 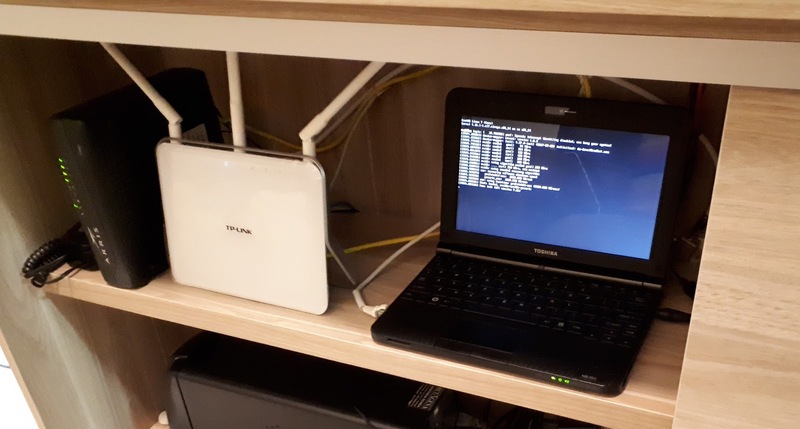 You basically need just a minimal Linux system installed and with LAN and Internet connectivity, and once Pi-hole is installed, it's just a matter of reconfiguring your LAN devices to use it as the main (and preferrably the only) DNS server. Time to go hands-on and deploy a Pi-hole server! 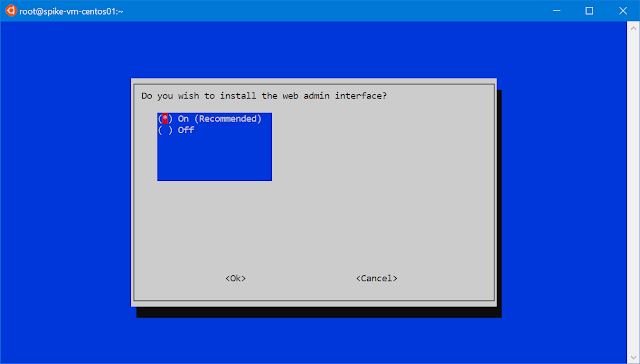 I'm assuming you have a computer with one of the main Linux distributions installed (can be an old laptop or even a Raspberry Pi, for instance; it's not resource-hungry), or a properly configured VM, with LAN and Internet access, before we proceed. I'm using CentOS 7 on an old Intel Atom netbook (and for the sake of this article, I used a VM to show the installation steps, since I already had Pi-hole deployed on my network). You have the option to tweak the SELinux policies to allow whatever Pi-hole needs, if you'd like to keep using SELinux, or disable it (not covered on this article). The next dialog asks if it should use IPv4, IPv6 or both. Choose accordingly to your network. 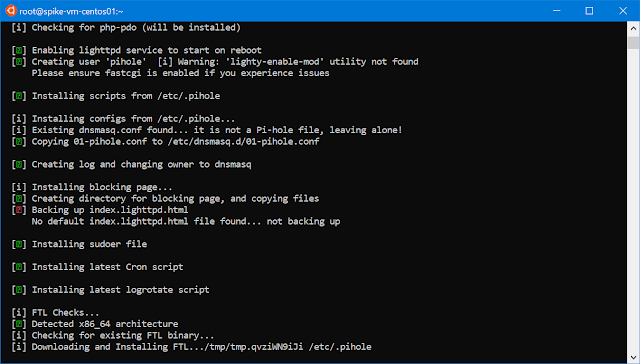 Go forward, and choose to install the beautiful and useful Pi-hole's web admin interface. Also keep enabled the log queries, otherwise the statistics will be rather useless. 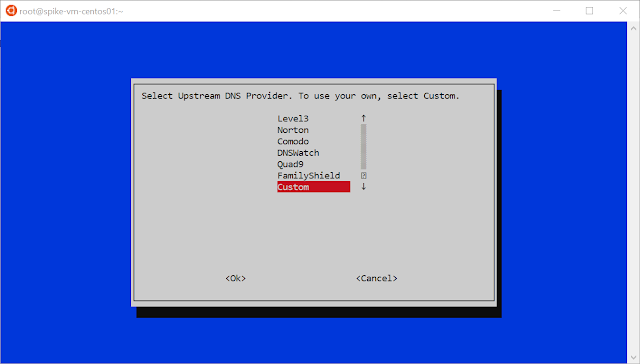 Finally, after installing some needed packages and pre-configuring its modules, the installation will be complete. It will show a final dialog with important information; take note of the IP address, the web interface URL, and its login password. And we are done! Of course, now we should do some additional configuration on both Pi-hole, our network router, and client devices. 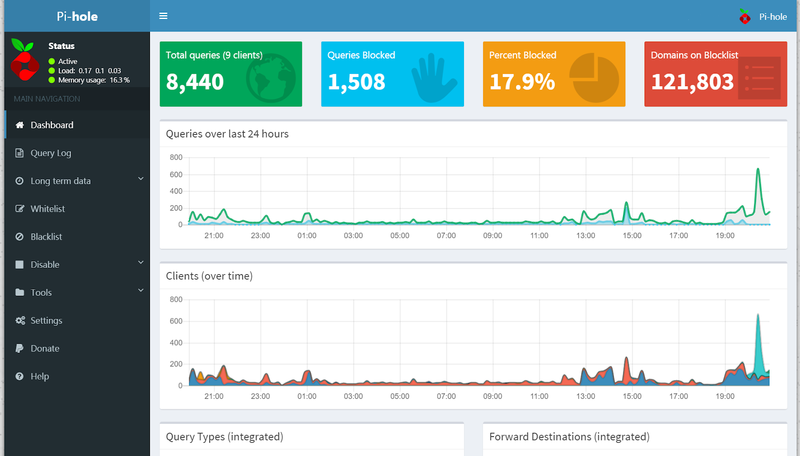 The Dashboard will show you an overview of Pi-hole's status and main statistics. In my case, since I already had it running for some days, it shows a total of 8440 queries from 9 clients, 17.9% of them blocked. The second tab, Block Lists, shows us which blocklists are in use. Pi-hole feeds them to DNSmasq, providing a very efficient way to block hundreds of thousands of hosts, as it comes configured by default. 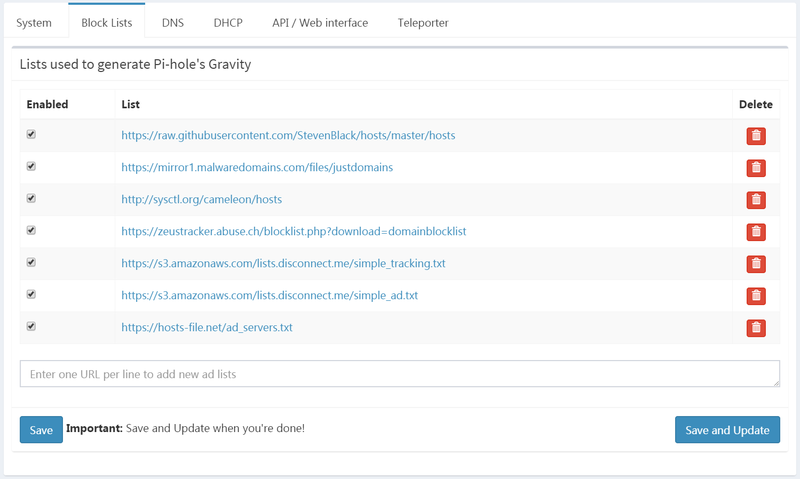 These lists are updated automatically, through a cron job created by Pi-hole. 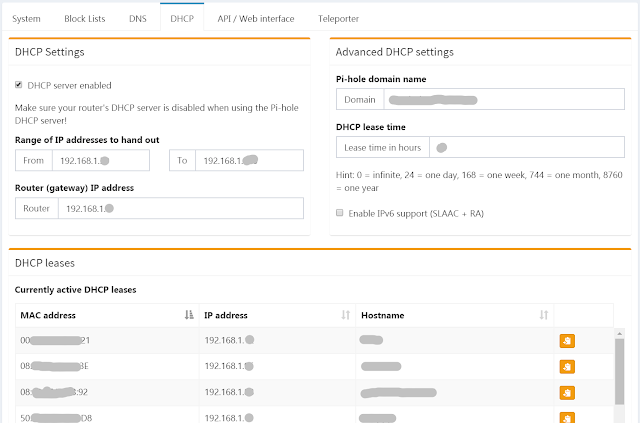 On the DHCP tab, we can configure Pi-hole to be also a DHCP server. 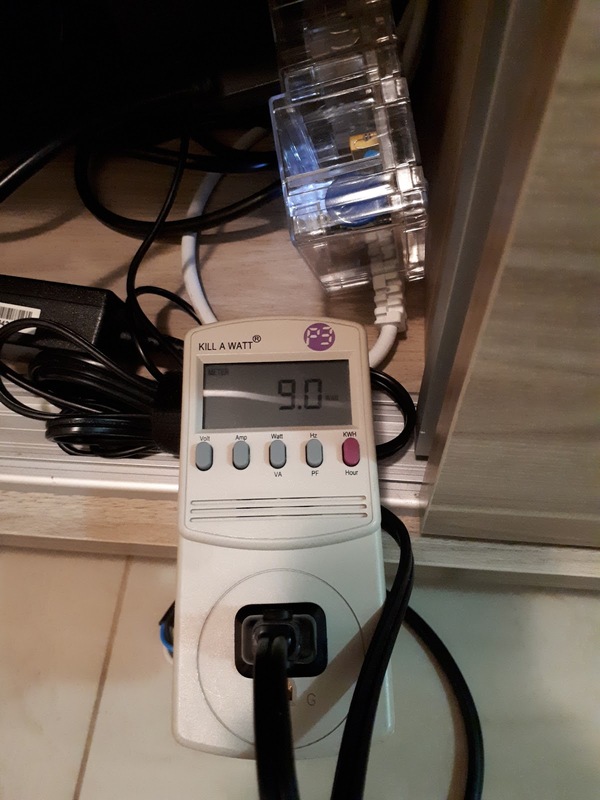 Yeah, it's not only a DNS server! I chose to use this feature instead of my router's built-in DHCP server, because it nicely integrates with the DNS, meaning that new hosts on my network that get an IP address through its DHCP, can be immediately reached also by name, without a single configuration change. How cool is that? 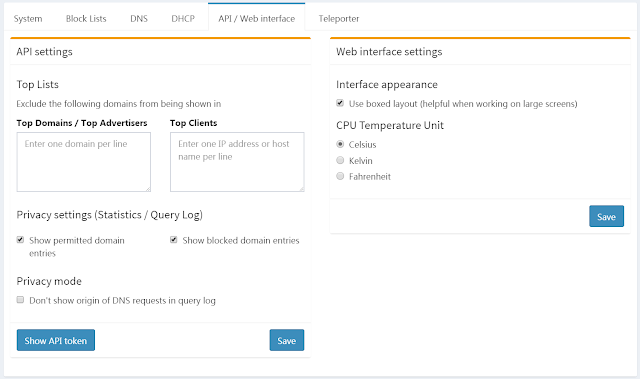 The final two tabs, API / Web Interface and Teleporter, allow us to configure some API and privacy settings, and to backup or restore Pi-hole's settings and lists. 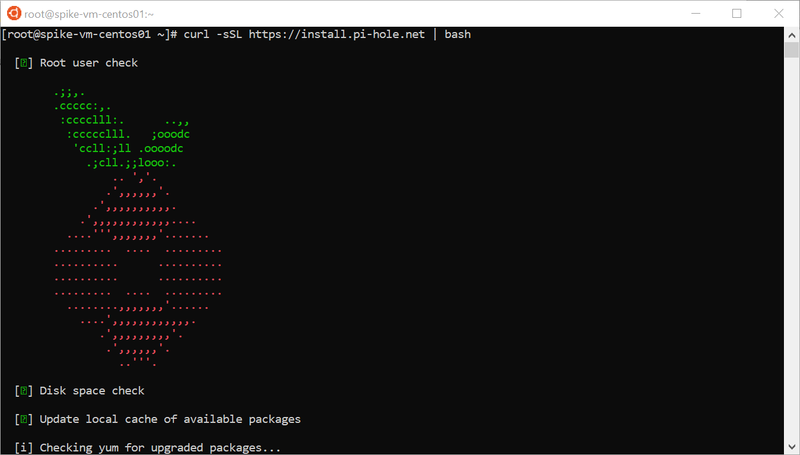 LAN DNS server: must now point to Pi-hole's IP address. 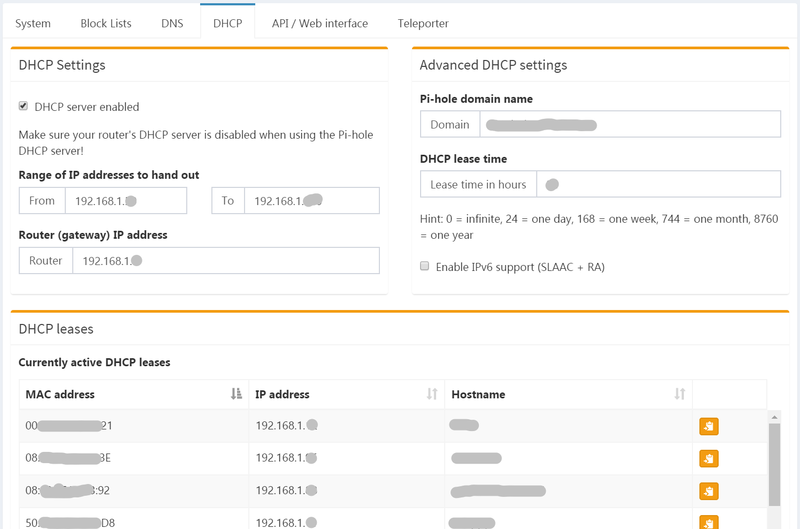 DHCP server: if you chose to use Pi-hole's built-in DHCP server, disable your router's; otherwise, leave it enabled. Each router's configuration interface is different, of course, but it's usually intuitive, given you now know what to do. 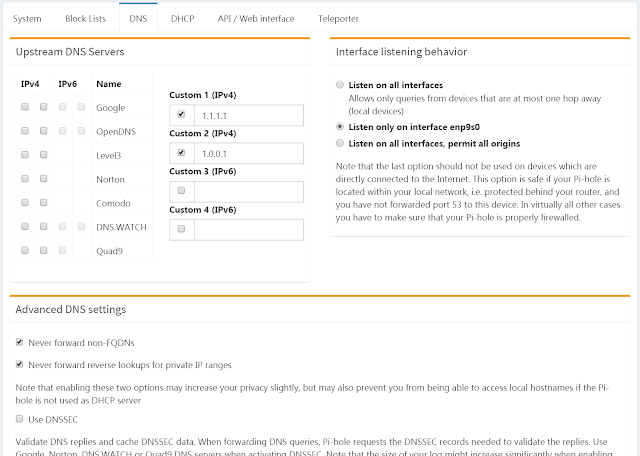 If all your LAN devices use DHCP (if you never configured an static IP address, default gateway etc., they do), just renew its information. The easiest way is to disable local connectivity (e.g. WiFi), wait 5 seconds, and reenable it. 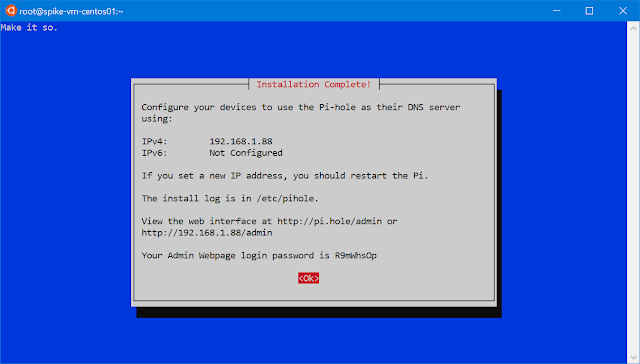 Check if it got Pi-hole's IP address as primary DNS server (there are several utilities to show that configuration, for Windows, Android, iOS etc. ); if it worked, you should see those nasty ads disappear and Pi-hole's statistics grow. 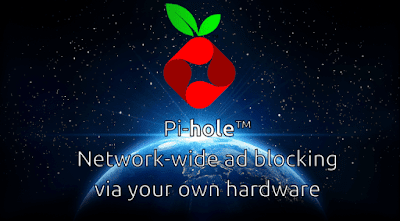 Pi-hole simplicity and efficiency makes it brilliant, and a perfect add-on to everyone's local network. And since it's not resource hungry, it can be installed on old hardware, or even a Raspberry Pi or similar. Since using Pi-hole means less ads in all my devices, and considering many of these ads are heavy to the CPU, probably those 9 watts are already paying for themselves.